Have you ever thought about hiring an apprentice for your company? Fashion Enter is England's leading training provider for the Fashion and Textiles programme Level 3 and 4 and we have recruited apprentices for ASOS.com, Hobbs, M&S, New Look, River Island, Marios Schwab and much more. We can help you find a young person to work across areas such as production, garment tech, design, buying and merchandising. The course is 18-months long and the apprentice spends four days a week with you and one day a week with us at the Fashion Technology Academy training for their qualification. By offering apprenticeships, you can ensure your workforce has the practical skills and qualification your organisation needs to thrive, now and in the future. How does an employer find an apprentice? Many employers find the process of apprenticeships quite daunting! Fashion Enter will take away this pressure from you and actually undertake the recruitment process for you as part of the service. Each employer operates differently so we have to work with flexibility to ensure we accommodate your needs. There is no fixed subscribed way of undertaking the interview processes but generally this is how the process works. An employer may contact NAS, National Apprenticeship Scheme, and we will receive an alert directly from NAS and we will contact you within 24 hours. I will send you an email and either we communicate via email or often we ring you to discuss in more detail the proposed job role that you need. We ask if you would like to visit our factory and training provision so you can review yourself how the training works. We work with you to define what the job role is and what the attributes are you need from the prospective apprentice. This may take a few hours or it may take a few weeks depending on how busy you are! We then upload the job description on to NAS and also our own networks. We have a database of over 80,000 and we have apprentices waiting for jobs always. We have a bank of CVs waiting and again depending on your needs we can send you candidates straight away or we can conduct a full interview process. We undertake the screening of the applicants for you as this is so time consuming. We divide the applicants into yes, no or maybe and we ring each applicant up to discuss the job details. We conduct telephone interviews first and then we ask each perspective applicant to come in for a dedicated interview. Sometimes we will hold group interviews to explain what the role of the job and the nature of the company but this depends on your confidentiality and also your requirements. 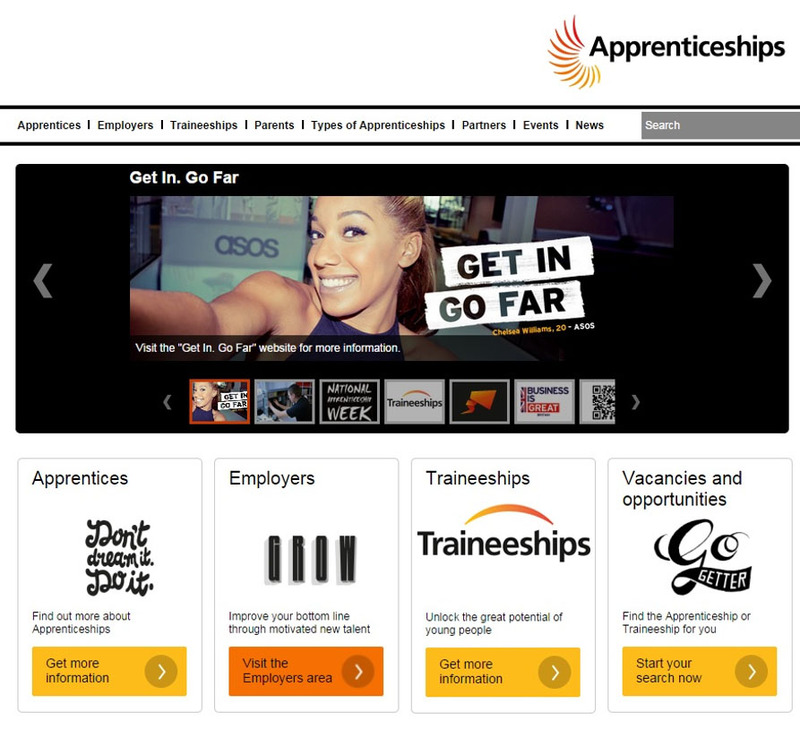 We agree a shortlisted number of apprenticeship applications e.g. recently M&S employed nine apprentices and we shortlisted over 500 applicants down to 30. A day’s interview then takes place of the applicants so in the case of M&S we had 15 applicants in the morning followed by 15 applicants in the afternoon. We undertake ice breakers, group training activities, group "fun" activates to assess team working, physcometric testing, what if scenarios, individual interviews and then we assess each candidate. We are either involved in the total interview process or the employer users our facilities to screen the applicants. Rather than employing an apprentice immediately you can offer a six weeks trail period at your place of work (there are age and eligibility restrictions that do apply however) or we can take on the apprentice for six weeks to trial the suitability of the apprentice on your behalf (again restrictions do apply). We will be checking for punctuality, communication skills, team building skills, use of initiative etc but the aim here for everyone is to allow the apprentice to have a taster experience. It’s a fun time for the apprentice and it gives the employer a level of security too - the right apprentice has been found! Each employer has a different way of interviewing and previously we have undertaken defined tasks such as embellishing a t-shirt, undertaking a quality check on faulty garments and presentation to the employer on a current trend. We discuss this thoroughly with you and the main determiner here is the amount of time you have available and how pressing your requirement is for an apprentice to start straight away. During this time a Fashion Enter representative will come to your premises to undertake a Health and Safety check. Once this has been approved and you have found your ideal apprentice we are ready to go! A contract of employment has to be signed by the apprentice and you and there is also a Learners Agreement that we ask each party to sign, including us! This is to show how dedicated we all are to the apprenticeship process. If you are a smaller company and this is potentially your first apprentice and employee we do help you considerably here and we do have templates for contracts of employment to offer you. We agree a start date and as our courses are roll on and roll off we are not inhibited by specific term times such as a September start each year. We know employers need flexibility, and support, and that's what we aim to do. We will agree a start date for the lessons with you and the educational team and we are away! Our educational team will then conduct regular employer visits to ensure you and the apprentice is 'happy' and one day a week the apprentice will attend formal learning at our factory and spend four days a week with you learning on the job with the employer. For larger cohorts of learners we can agree for our specialised training team to come and undertake the learning at your place of work too. This normally occurs outside of London. The Apprenticeship Levy is effective from 6th April 2017 and will require employers to invest in apprenticeships, with the size of the investment dependent on the size of the business. The Apprenticeship Levy will be a tax on large UK employers with a PAYE bill of over £3 million per annum. These Employers will be required to pay 0.5% of their annual payroll into the Levy and these funds will be used to pay for new Apprenticeships. What happens next for employers? Once employers in England have registered and paid the levy, they will then be able to access funding through a digital apprenticeship service account. This will allow them to select and pay Government-approved training providers and post apprenticeship vacancies. Initially, the service will only be available to businesses paying the levy, but the plan is to give all employers access to the digital account by 2020. In addition to the amount paid into the account, the Government will apply a 10 per cent top up on funds, meaning that for every £1 paid in, the employer gets £1.10 to spend. Businesses will have 24 months to spend their funds ('vouchers') before they expire. We already deliver apprenticeships for many leading organisations including ASOS, Marks & Spencer, New Look, Topshop, Topman, Jigsaw, Hobbs, M&Co, People Tree, Moseley Road, N16 Vintage, Lipstick Boutique, Find of London and many more.